My parents are both from small towns in Mississippi, but I came into being as their firstborn in Marin County, California. After the Raiders won the Super Bowl as the first wild card team to make it the whole way, I was in. I bought a poster with all the team’s helmets lined up in rows. Some kids count sheep. I would memorize the football divisions in the AFC and NFC. I read and re-read Strange but True Football stories, learned about the guy with half a foot who kicked a 63-yard field goal. 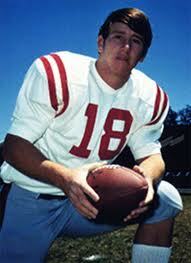 I bought those mini football helmets from the gumball machines for a quarter a piece—a week’s allowance. 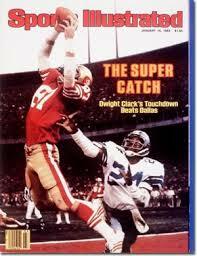 The standout moment for me happens to be known now as The Catch. We were gathered around the Sears Roebuck 22-inch with my mom and dad and three-year-old brother. The Cowboys were “America’s Team.” Always good, it seemed inevitable they would win, and I had already begun hating them for it. The Cowboys were up 27-21 with time dwindling. Let’s just let this image speak for itself. We stood. We screamed. We went on to win Super Bowl XVI. Football is a complicated sport, full of stops and starts. Eleven men end up in a pile of dust. It can get dull. Well, I guess that’s why it’s a “quarterback driven league” now. It’s also brutal, and the changes they’re trying to put in place right now to make it less so are great in spirit but not in practice. Football is also often loud and obnoxious, subject to constant review, and over-commercialized. They can spend 5-10 minutes barraging you with more truck and phone commercials while musing on whether a toe touched the last white wisp of out-of-bounds fescue. If it weren’t for being able to fast forward and mute I don’t think I could stand it anymore. You can also create compelling arguments that fandom is mindless jingoism: my city is better than yours. We can call it a type of tribalistic warfare. There are the fans who will cheer when their own struggling player goes down with injury. There are fans who will attack and maim other fans. Yes, there is plenty to hate about America’s religious sports fanaticism. In the end what are we really cheering for? This year, I’ve been asking myself that question more than usual. With that said, there are plenty of intangible rewards. Call it the magical thinking of fandom. It’s something more common and necessary than whether or not one’s team wins a dramatic championship. Something like when we connect with the personalities, when we feel like somehow we “know” the players. When identification happens, empathy happens. We somehow humanize these “role models” through our identification. About three Christmases ago my parents gave the family a framed photo of each of the three Manning quarterbacks. It now resides in my oldest son’s room. They also got us a stuffed Colts football. Peyton Manning is one of those guys I naturally cheered for and hoped would do well, but no one in the family had ever been a Colts fan. We all naturally cheered for Peyton and Eli, mostly I thought just because they were really good at what they did and seemed humble about it. Only after seeing The Book of Manning documentary ( video below) a few nights ago did I realize what it’s really all about with the vicarious power of the Mannings. Why do we cheer for the people we do? People who are otherwise complete strangers? Sometimes we simply like the uniform. Sometimes it’s the transcendent play of a single player. Sometimes it’s because they come from a shared place. None of it remains relevant to us, though—personal and important—if we don’t somehow discover ourselves through the players, identify with them, struggle to victory. Yes, victory helps. Sometimes too a team or a player reminds us of who we are, who we were, or who we want to be. 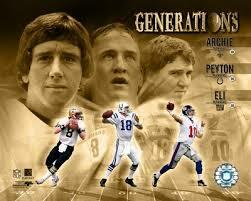 I think in the case of Archie, Peyton, and Eli Manning, all the above is true. If I were a great quarterback, I would want to be a smart one. I would want to stay hungry even with my success. I wouldn’t want the size of my bank account to change the size of my ego. I’d want to stay humble and constantly think about how I could improve. Come to think of it, this is more or less what I could say about trying to live life in general—or being a father in particular. Archie made his life about his children, not about himself, when he clearly had every excuse to be otherwise. His father committed suicide during Archie’s own rise to stardom—and Archie was the one to discover his father’s body. Already an All-American, he volunteered to quit college, and stay home and help his mother and sister. Instead of the obvious anger he could have easily let consume him, he prevailed with grace. He then went on to legendary success on the field. His humility off the field is what really gets me. Now I see what all the excitement was about when my mom would tell me statistics about how many total points Eli scored as an Ole Miss Rebel. Now I see why my parents got the Colts paraphernalia and why they donned the horseshoe caps and jackets for a time, and why now for the past two years they’re wearing Denver’s orange and blue. There are different ways to be loyal. In fact, after what learned from watching The Book of Manning, I found myself wanting the Broncos to win the Super Bowl more than any other team. 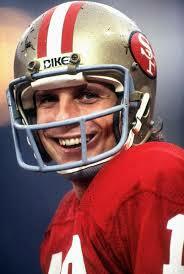 I still have a place in my heart for the 49ers and I cheer somewhat half-heartedly for our regional teams. But more than anyone else, I think I’d be proudest and loudest for Peyton Manning riding off into the sunset with another couple dozen records shattered and a lot less run-around with the haters who measure greatness mostly by championships won. I’m sorry, but Tom Brady may be a surgeon, but he’s clearly the beneficiary of an incredible system and some truly superior defenses. Oh, and he never even would have gone to that first Super Bowl if it wasn’t at the 2001 Raiders’ expense with one of the worst rules that the NFL ever instituted, the Tuck Rule. Do we not know a fumble when we see one? Sports are a part of my culture, my personal and collective history. Sports are fun. I’m not just making excuses for why you might find me wasting away another afternoon on the couch in the fall on any given Sunday. Sports are a way for us old people to connect with our young. And that never gets old and keeps us young. When Archie’s dad was driving him to college his freshman year, Archie asked him what he thought he should major in, and what did he think he was good at. “I just want you to be a good guy,” his dad said. I should say a lot of us could do worse than to major in being a good guy. And when it comes to my own two sons and how they think of me both alive and dead, I guess that’s about the most important thing of all. Not whether I was a great writer or teacher or leader or funny or smart or whatever. I want them to remember me as someone who loved them, who put them ahead of himself, who was one that you’d always want to cheer for, one of the good guys.